I have been thrilled to see mention of my designs elsewhere in the last few days so thought I would share these sightings. Firstly I was contacted by Spinnygonzalez on Ravelry asking if she could include a mention of my Mimizan hat pattern in a blog post she was writing linked to the Ravelry Indie Gift-A-Long. I was very happy for her to do so and even more happy when I saw the link to the post tweeted, and realised the stellar company I was in. Aurelie’s post, inspired by working on her own gorgeous Woodcarving mitts brings together a number of designs which use different techniques to create chevrons and includes patterns by Lee Meredith, Alex Tinsley, Laura Aylor and Andi Smith. Mimizan is one of my favourite designs, partly due to the memories it evokes and the fact that whenever I hear back from anyone who’s knitted it, they always say how much they enjoyed the knitting and love the hat they have created – a perfect combination in my view. I also love that Aurelie has also been to Mimizan so will have seen the giant fir cones that inspired the design. Secondly, I picked up a copy of The Knitter at the Supermarket yesterday after a day of rushing about and then, being home alone for dinner, sat down to eat and have a good read. 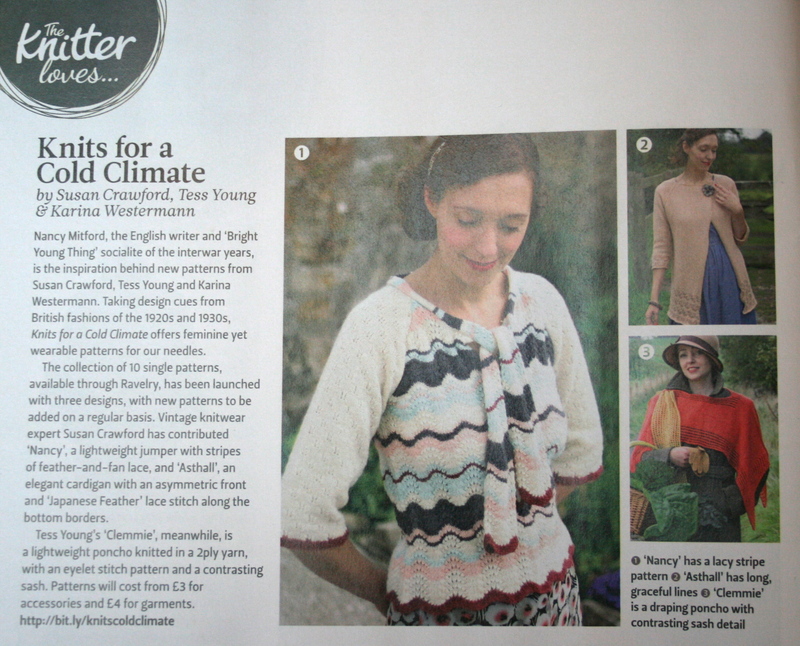 It was then I noticed that ‘The Knitter loves…’ section was dedicated to the ‘Knits for a Cold Climate‘ collection, the collaboration with Susan Crawford and Karie Westermann which featured picture’s of Susan’s Nancy and Asthall designs and my very own Clemmie. Since the publication of the magazine, two new patterns were launched at the Harrogate Knitting and Stitching show, Karina’s Noblese Oblige and a new design by myself which will be having it’s online launch later this week….